BM Engineering supplies a comprehensive range of steam traps to an array of industries and for a range of applications. Since launching in 1999, we have grown to become one of the primary suppliers of valves to many process industry businesses in Scotland. Boasting more than 40 years of combined experience in the valve industry, BME is an official supplier of Valsteam ADCA’s extensive range of steam equipment. With that in mind, our technical team has an in-depth knowledge of steam trap applications. We can, therefore, offer unbeatable advice and practical solutions to guarantee that your steam applications run as efficiently and cost-effectively as possible. Valsteam has an impressive product portfolio that includes: steam traps, steam control valves, pressure reducing valves, heat exchangers, pipeline ancillaries and specialised equipment. Their comprehensive range of steam traps employ a variety of materials, from DN15 to DN 150, and are designed for pressure up to 80 bar and flow rates of over 100,000 Kgs/h. Valsteam’s range provides exceptional filtration to all steam trap applications. Steam jacketed capsule (disc and cover set). How do I monitor my steam trap? You can use an integrated steam trap monitoring system to monitor your steam trap and allow for reliable testing. These devices consist of a sensor, fitted inside the steam trap, which detects the physical state of the medium through conductivity. What kind of applications require a steam trap? 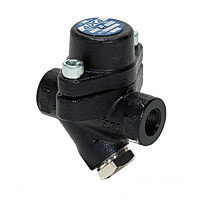 Drip applications – Drip applications are the most common application for steam traps. This involves removing condensate formed in steam lines when the steam has lost its heat energy. Process applications – Process trap applications involve removing condensate and air from a specific heat transfer process, such as a radiator or heat exchanger. Tracing applications – Steam tracing uses steam to raise a product’s temperature by using steam-filled tubing or jacketed pipes.